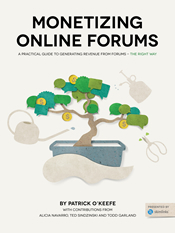 Monetizing Online Forums, the ebook that I authored that was published by Skimlinks in July of 2012, has now reached 20,000 downloads. When I began to work on the ebook (when it was only expected to be 10-20 pages, rather than the 100 it ended up being), I didn’t really have any expectations. I had never written a free ebook and, frankly, I didn’t really want to. Most free ebooks just aren’t particularly valuable. I don’t write stuff for list generation. I write stuff so people can feel empowered and not need to contact me at all. But Alicia Navarro and Joe Stepniewski of Skimlinks convinced me that I could do what I wanted, and treat it like my second book. We released it after 9 months of development, on July 2, 2012, and I’m surprised by how steady the download count has been. Our numbers are pretty conservatively counted. If you go to the website right now and download the PDF file 1,000 times, you’ll count as 1. If you download the PDF, ePub and MOBI files each 1,000 times, you’ll count as 3. So these aren’t really padded numbers. We’ve been able to reach this point because of the people who have supported the book. Thank you to everyone who has downloaded it and spread the word about it. Thank you to all of our partners in marketing the book, including Ning, ClickMillionaires.com, BuySellAds, Admin Talk, phpBBHacks.com, TopAdmin, Launch.forum and eMint. In particular, Ning has been a huge part of 2013 and 2014 numbers. Thank you to Allison Leahy and Crystal Coleman for their support. Thank you to my co-authors, Alicia, Ted Sindzinski and Todd Garland, for adding value I could not. Thank you to everyone at Skimlinks who has contributed in some way to the success of the project. I’m really grateful that a book with forums in the title has been able to pull down these numbers. I write about forums not to pigeonhole myself into being the “forums guy,” but because forums are the purest essence of community and because they deserve to be written about, and not get lost in the shuffle of tools. Patrick, I just downloaded this yesterday (currently reading) and I have to say its excellent work, pretty much like the rest of your site. This site is like a little positive thinking watering hole for community managers, chuck full of information on how to run a better show, even if just for small niche forums. I hope you get a lot of good feedback for what you do and I am gladly adding my name to the list of people who appreciate these articles. Thank you!